When the Gaia GPS watch app is paired with Gaia GPS on your iPhone or iPad, your Apple Watch will give you the ability to see your location, start/pause track recording and check stats all at a glance. 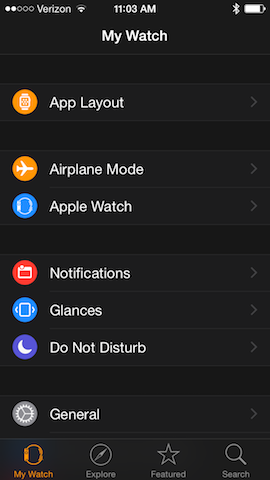 To make using Gaia easier on the watch, you can add it to your "glances" (Watch OS 1 & 2) or "dock" (Watch OS 3+). 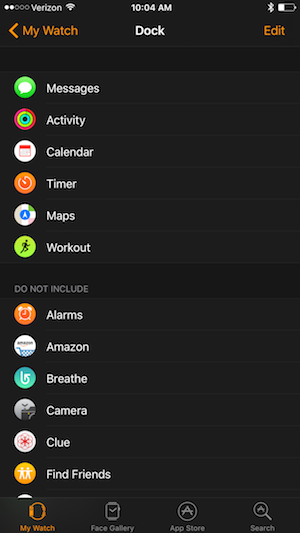 Find the Apple Watch app on your device, select "glances" and add Gaia GPS to the list. You can choose which stats are readily available on the watch. 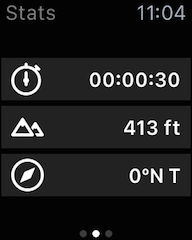 * The time, pace, distance, and ascent/descent stats are only displayed on the watch app when recording a track. Start recording from your mobile device, and pause from the watch. The first screen will show recording time. Tap once to pause and again to continue. The third screen is a live preview of the map screen. Follow your progress and check your location without taking out your phone. 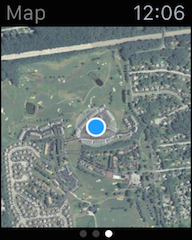 Zoom on the map and center on location. 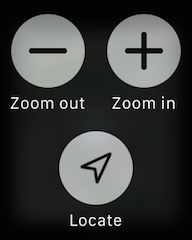 Hard press the screen to bring up the options to zoom in/out and go to location. Tips on improving battery life with Gaia GPS. Connecting the watch to your device using Bluetooth provides an additional battery drain. If you are planning a longer hike, we recommend an additional battery or charging unit. "Unable to load map" - This happens when the map is not downloaded, or you zoom in closer than the map is downloaded. "Map source not available offline" - This happens when trying to use a vector-based map source on the watch. These sources are not compatible with the watch. When the phone is online, servers can render these maps on the watch, but downloaded maps for these sources won't display while offline. Vector sources include all MapBox sources and Gaia Topo. Apple Watch module of this app Definitely needs updating. I have the current firmwares for both my iPhone 6s and Apple Watch, and the most current version of Gaia. Works fine on the phone. Very buggy if not worthless on watch. Reported to Gaia with logs. Same with other people on same trip. LOVE the app on the phone, but only works sometimes on the watch. Zooming in and out is really poorly done. How about the crown button? Not being able to get vector maps for offline use is also a big problem. It would be great to have a complication as well, would be nice to make a watch face with Gaia right there instead of going through my list of apps every time I want an update. The zoom and pan on the watch definitely need updated. I got a watch mostly for SAR using Gaia, and have been woefully disappointed. It feels like the entire Gaia watch app was coded in one afternoon. On a Friday. Before a three day weekend. Most of the time Gaia GPS shows Not Connected on my Apple Watch 3rd Generation. As a result it does not update the map location or the statistics. You have to uninstall it and reinstall to get it connected again. What about an option to download a track to the watch and then follow the track using haptic events, or optionally voice events, for left, right (or even vertical up or down for climbers). No need to ever look at the phone or watch. I was able to test the app on an Apple Watch today. It’s very slow to zoom and seems to have limited functionality. I love Gaia but it’s performance on the watch is definitely lacking. Improvements in this area would surely attract more Gaia customers? I’m glad I was able to test it before I purchased an Apple Watch. An update for the Apple watch functionality would be very welcome. The map, my orientation, my track and the planned track is what I'm looking for. My watch arrives tomorrow, I hope to find this in the current app. 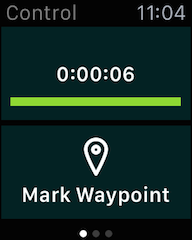 The map screen in the watch app will show your current location, waypoints, current track recording. You can also view planned routes saved in the app when you using the Guide Me feature for the route. Wonderful, thanks. In that case this help page needs an update with some more applicable screenshots. All I ever get is "unable to load map" at the bottom of the screen. And yes, I've saved offline maps for my local area. I've been using GAIA for years, but just recently got an Apple Watch. So far, the app is useless. I'm sorry you are having trouble loading maps on your Apple Watch. I sent you an email directly to troubleshoot this issue. Doesn’t look like this sends your activity to the Health app, it really should. The watch app, at this point, is more of a basic stats view of the app on your phone. Needs to add heart rate and send info to Health to be useful. Also, the map portion is really hard to use!